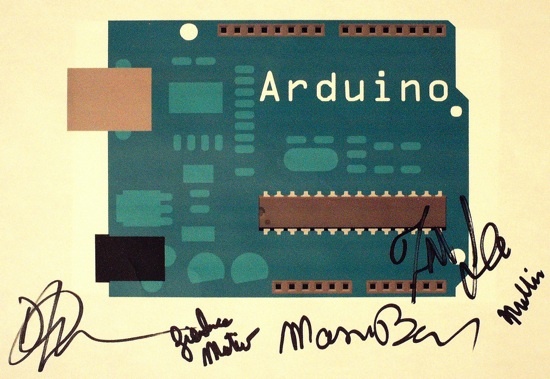 Arduino – signed by all 5 core team members « Adafruit Industries – Makers, hackers, artists, designers and engineers! We met all 5 Arduino core team members yesterday in NYC – We love these guys and they inspire us! Heros for bringing art, design, electronics and open source hardware to many people. Thank you for your hard work and generosity guys! I like Arduino so much, I made the Arduino Mega schematic my login screen for my mac.